The Holika Ropan aka Danda Ropan ceremony starts a countdown to one of the greatest four festivals of Hindu communities, "Holi". One of the most significant days for North Indians, Maghi Purnima is the tithi (date, Hindu calendar) when some Hindu communities kick starts the rituals and preparations of Holi festival. This way, the day and this occasion is an important affair for people observing Holi traditionally. However, many western parts of India avoid this ritual too. The Purnima or full moon night of Magh month is the auspicious day when Holika Ropan is performed. Like other celebrations of the great Holi festival, this Holika Ropan or Danda Ropan celebration is also observed as per Hindu calendar on Maghi Purnima or Magh's full moon. 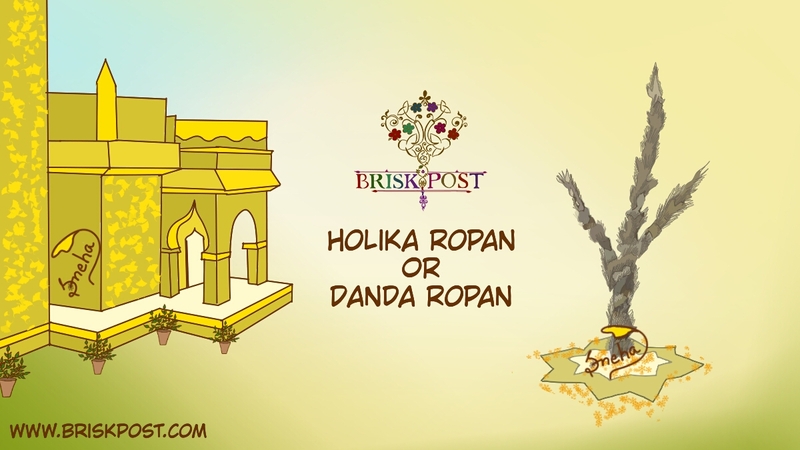 What Is Holika Ropan or Holi Ka Danda Ropan? A danda (thick wood and thin woods arrangement) is installed this day. From then, the arrival Holi is announced. The next Purnima that falls after the Magh Purnima, is known as Holika Dahan day. This is the day when Holika effigy is burnt as the symbol of burning the wrong and evil. Holi pyre is lighted on this right next, Falgun's full moon. Prahalad was a great devotee of lord Vishnu and the son of Hiranyakashyap and Kayadu. Hiranyakashyap was an egoistic king who assumed himself a God and threatened everyone to offer him their worships. His son Prahalad didn't stop and kept following the God Vishnu, which annoyed his father Hiranyakashyapu so much that he decided to kill his own son. When his no plan worked to kill the boy as lord Vishnu saved him every time, he took help of his sister Holika. Holika has a vardaan (boon or power) that she will always remain unaffected by fire and it couldn't burn her. As per the plan of brother-sister, Holika sat on the burning fire, taking Prahalada in her lap in order to burn him and come out safe. But their plan proved opposite to them and Prahalad came out safe. Holika got burnt in the fire that was set for Prahalad. This way, the good won over evil. And from then, Holika Dahan is observed as a great day and its preparations start many days before. On Holika Ropan or Danda Ropan, an arrangement of danda (woods) is installed symbolizing the historic set up. On a proper muhurat at Magh Shukla Purnima's evening, the puja-archana (worship) is being done with taking rites and rituals into consideration. Purohit or Panditji (Brahmin) and his team offer prayers and singing to the earth. Then the place where Holika Effigy is supposed to be installed, that is painted with pure soil and gobar (cow-dung). Then the religious ceremony is performed traditionally. The conducted religious customs involve yagya too, which is also known as yagna or yadanya or hawan, This vedic ritual is performed by igniting ritual sacred fire, in which various oblagations are devoted with spelling mantras (verses). These oblagations are believed to reach to God or Goddess directly. The year 2019's Danda Ropan is falling on Tuesday, 19 February 2019.